Meh-rih-TIJ, rhyming with Heritage. This is a made-up word, registered as a US trademark, that wineries must pay to use on their wines. Back in 1989, wineries were all choosing names for their various blended wines, and it was getting hard to keep track of them all. An association was formed to try to define a "Bordeaux Blend" of grapes that was done on non-French soil. They had over 6,000 people submit choices for the name of this blend, and "Meritage" won. This is a combination of the words "Merit" and "Heritage", and shouldn't be pronounced as if it were French! First off, this can't be a mass-marketed wine. The release of Meritage must be under 25,000 cases. It has to be a "high-end" wine for the winery - it can't be their bargain basement offering. And finally, it has to be a blend of certain grapes. These are: Cabernet Sauvignon, Cabernet Franc, Merlot. There is also a white Meritage, which is far less common. This uses Sauvignon Blanc, Semillon, and Muscadelle. Just like Bordeaux, since it's made with the same grapes!! There's a rich, full aroma to it. Depending on the particular blend, it can be blackberry, black cherry, spices, chocolate, and vanilla. Most Meritages have the Bordeaux signature flavors - cigar box, rich fruits, with a hefty feel. It's great with a steak, or with game meats - venison, pheasant, or so on! Meritage should be served at 64F for the best flavor. Cooks Illustrated deemed BelGioioso Parmesan Cheese the Best Parmesan in the summer of 2007! BelGioioso Parmesan is a hard cheese with a full, slightly sweet and nutty flavor that enhances a number of Italian dishes. Rated World's Best at the Biennial World Natural Cheese Contest, BelGioioso Parmesan Cheese is aged over 10 months in special curing rooms. This naturally low-fat cheese is typically grated or shredded over pasta, rice, soups and salads. Its rich flavor also makes it perfect for sauces, snacks and desserts. Two pounds of BelGioioso Parmesan Random Weight Wedges (approximately 3-4 wedges) offer a savings of $1.97 from individual wedge price. Parmesan cheese is one of the most popular Italian cheeses, adding a bit of sweetness and a rich, full flavor to a wide variety of delicious dishes. A BelGioioso Parmesan cheese wedge gives you fresh, full-bodied Parmesan you can slice, grate or shred over pasta, rice, soup, salad and more. With a wedge of this naturally low-fat cheese, you can add the perfect amount to your favorite meal to make your favorite recipe even more delicious. 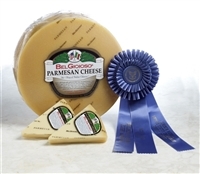 BelGioioso Parmesan cheese was rated the World's Best at the Biennial World Natural Cheese Contest, with a special recipe aged for 10 months before coming to your table. Five pounds of BelGioioso Parmesan Random Weight Wedges (approximately 8-9 wedges). MAKE THIS INTO A GIFT BY ADDING OUR ADD A GIFT CRATE OPTION! 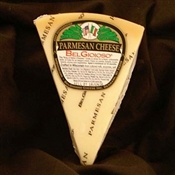 Cooks Illustrated deemed BelGioioso Parmesan the Best Parmesan in the summer of 2007! 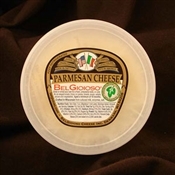 BelGioioso Parmesan Cheese is a hard cheese with a full, slightly sweet and nutty flavor that enhances a number of Italian dishes. Rated World's Best at the Biennial World Natural Cheese Contest,BelGioioso Parmesan is aged over 10 months in special curing rooms. This naturally low-fat cheese is typically grated or shredded over pasta, rice, soups and salads. Its rich flavor also makes it perfect for sauces, snacks and desserts. BelGioioso Vegetarian Parmesan cheese gives your favorite vegetarian dishes a sharp kick and extra zest. With a slightly sweet aftertaste and a piquant zing, BelGioioso Vegetarian Parmesan enhances the flavor profile of a wide variety of dishes. Known as the king of cheese, Parmesan is used in nearly any dish, from pizza to ravioli to spaghetti and salad. Nothing pairs better with a hearty marinara sauce or a crisp Cesar salad than the tangy, nutty flavor of Parmesan. With a case of random weight wedges you can shred, grate or slice this crumbly cheese onto all of your favorite dishes and let your restaurant customers or guests enjoy a well. All Wheels ordered by noon on Thursday will be ready for shipment the following Monday. Your wheel is ordered specifically for you so you may request that it is cut into 4 quarters or 2 halves in the comments section! BelGioioso Vegetarian Parmesan Cheese is made from non-animal derived rennet, yet still has all the pure taste of Parmesan. With a sharp nutty flavor, a hint of sweetness and no animal rennet, BelGioioso takes their original, award-winning Parmesan recipe and makes a slight change especially for vegetarians. The granular texture makes it easy to grate over pasta, salad, breadsticks, sauce or any recipe that needs to punch up the flavor. With a case of random weight wedges you can add Vegetarian Parmesan to all your favorite dishes and enjoy a bold and pleasing flavor palate, even with just a light sprinkle. Nutty. Full Flavor. Slightly Sweet. There are many ways to describe BelGioioso Vegetarian Parmesan Cheese but many people simply savor this flavorful cheese because non animal derived rennet is used in its production. Aged 10 months, it is ideal for shredding, grating or snacking. This item contains 12 - 5 ounce cups of Vegetarian Parmesan for a total of 60 ounces. Add BelGioioso vegetarian Parmesan cheese to a bowl of vegetarian spaghetti, sprinkle on top of lasagna, use in risotto, soups and more. With a rich, nutty flavor and a hint of sweetness, Vegetarian Parmesan cheese from Artisan Pantry gives you the perfect finishing touch on any dish. Made from rennant not derived from animals, vegetarians and vegans can enjoy the full flavor of BelGioioso Parmesan cheese on all their favorite dishes. Grate or shred a BelGioioso vegetarian Parmesan cheese wedge over nearly any dinner to enjoy fresh, tasty cheese or cut off a slice just for a snack. Order a small size to try or a full wheel. BelGioioso Parmesan is a hard cheese with a full,slightly sweet and nutty flavor that enhances a number of Italian dishes. Rated World's Best at the Biennial World Natural Cheese Contest, BelGioioso Parmesan is aged over 10 months in special curing rooms. This naturally low-fat cheese is typically grated or shredded over pasta, rice, soups and salads. Its rich flavor also makes it perfect for sauces, snacks and desserts. Our Francis Coppola Pomodoro Sauce and Pasta Gift Crate is paired with a wedge of BelGioioso Parmesan Cheese for a wonderful main course or side dish. 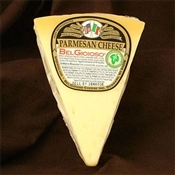 Ten pounds of BelGioioso Parmesan Random Weight Wedges (approximately 16-17 wedges) offers an approximate savings of $13.34 from individual weight price. Nutty. Full Flavor. Slightly Sweet. There are many ways to describe BelGioioso Vegetarian Parmesan Cheese but many people simply savor this flavorful cheese because non animal derived rennet is used in its production. Aged 10 months, it is ideal for shredding,grating or snacking. Packaged for freshness 10-12 months. Nutty. Full Flavor. Slightly Sweet. There are many ways to describe BelGioioso Vegetarian Parmesan Cheese but many people simply savor this flavorful cheese because non animal derived rennet is used in its production. Aged 10 months, it is ideal for shredding, grating or snacking.